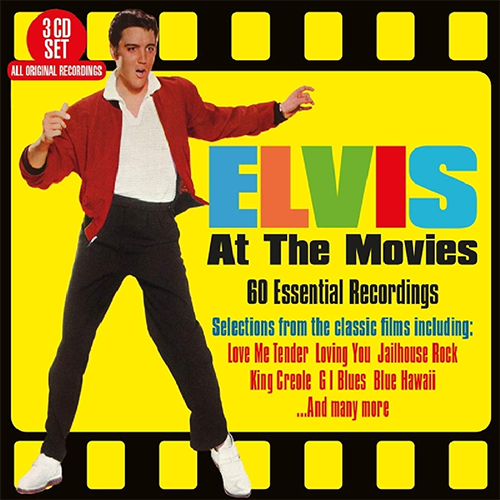 Elvis at the Movies will be released on March 29, 2019 by the Big 3 (H’Art) label and will contain 60 tracks from the movies Love Me Tender, Loving You, Jailhouse Rock, King Creole, G.I. Blues, Flaming Star, Blue Hawaii, Follow That Dream and Girls! Girls! Girls!. CD 1: Love Me Tender - We're Gonna Move - Mean Woman Blues - (Let Me Be Your) Teddy Bear - Loving You - Got A Lot Of Livin' To Do - Hot Dog - (Let's Have A) Party - Young And Beautiful - I Want To Be Free - Don't Leave Me Now (1) - Treat Me Nice - Jailhouse Rock - (You're So Square) Baby I Don't Care - Crawfish - Lover Doll - Trouble - Dixieland Rock - Young Dreams - New Orleans. CD 2: King Creole - Hard Headed Woman - Don't Ask Me Why - As Long As I Have You - Tonight Is So Right For Love - What's She Really Like? - Frankfort Special - Wooden Heart - G. I. Blues - Pocketful Of Rainbows - Shoppin' Around - Didja' Ever - Blue Suede Shoes - Doin' The Best I Can - Flaming Star - Wild In The Country - I Slipped, I Stumbled, I Fell - Blue Hawaii - Almost Always True - No More. CD 3: Can't Help Falling In Love - Rock-A-Hula Baby - Moonlight Swim - Ku-U-I-Po (Hawaiian Sweetheart) - Slicin' Sand - Hawaiian Sunset - Beach Boy Blues - Island Of Love - Hawaiian Wedding Song - What A Wonderful Life - Follow That Dream - Angel - King Of The Whole Wide World - Home Is Where The Heart Is - Girls!, Girls!, Girls! - I Don't Wanna Be Tied - Earth Boy - Return To Sender - Because Of Love - We're Coming In Loaded. My opinion is I already own all this music many times over, and in superior sound on FTD releases. Pass.